Beynac, a perfectly preserved medieval village near the Dordogne River. Though popular with Europeans, the department in the southwestern part of the country is less familiar to Americans. Those who do venture there will be treated to bucolic landscapes, epicurean delights, a laid-back pace of life, and some of the oldest artwork ever created. One writer wanders the region marveling at cave paintings, devouring foie gras, luxuriating in a hotel once beloved by Henry Miller, and pondering his place in the grand sweep of human history. Spend a few days in the Dordogne and there will come a moment when you cannot help but notice the flow of time. I don't mean the ticking of the clock or the pressure to cram more sights into the span of a week. If anything, the languorous pace of life in this department of southwestern France erodes that guidebooky impulse to overdo it on churches and museums. I'm talking about time's slower, deeper currents — a continuum that stretches back centuries. For me, the moment came at the top of a hill in Limeuil. Limeuil is the sort of small, cobblestoned village you might accidentally, tragically drive through without stopping. It is distinguished by its daunting verticality: all of its narrow lanes wind up a hill. The hill is crowned by the Panoramic Gardens, a place where walnut, chestnut, and oak trees overlook the confluence of two significant rivers, the Dordogne and the Vézère. In the rolling terrain surrounding these rivers, oh, about 17,000 years ago, the evolution of human consciousness took a major leap forward. The landscape was different back then, barren of trees, yet swarming with beasts. Those beasts inspired the Ice Age residents of the Dordogne to begin painting and carving beautiful images on the walls of caves throughout the region. Before visiting the Panoramic Gardens, I'd eaten lunch at a restaurant called Au Bon Accueil. Maybe the multiple glasses of 2012 red from Château Laulerie in nearby Bergerac had loosened me up enough to commune with the primordial history of the place. Or perhaps it was the salade de gésiers confits — though calling it a salad would be optimistic from a health standpoint. Really, it was a frill of greens cradling a hot, salty, fatty mound of duck gizzards that had been simmered to the apex of tenderness, served in a style that chefs like to refer to as "dump it on a plate." I inhaled the dish with atavistic delight, then followed it with cross sections of rolled-up roast pork, a regional specialty, accompanied by hot-from-the-oil crescents of garlic-flecked potatoes. After finishing with a slab of walnut cake, I took my slow stroll up to the gardens, where tufts of mint and dill and tarragon and thyme perfumed the air. I breathed in the good smells, feeling guiltlessly full from my meal. We are wired to want this, I thought. From left: A stone cottage next to a cliff face, near the entrance to the Cave of the Sorcerer; Du Bareil au Même, a tapas bar in Montignac; a street in Limeuil. I remembered a passage from The Cave Painters, a 2006 book by Gregory Curtis that had provided me with an excellent tutorial on the mesmerizing prehistoric art of France and northern Spain. Mystery will always enshroud the paintings and engravings, but some archaeological evidence, Curtis writes, suggests that the Gallic hunter-gatherers of 17,000 years ago "broke every bone open to get at the marrow inside." They probably slurped it down raw, then made a soup by dropping the bone fragments into water warmed by hot stones pulled from a fire. As I ambled through the Dordogne for four days in May, I couldn't shake this image of our ancient ancestors rooting at the marrow. Maybe it's because the local cuisine is so unabashedly, even punishingly rich. Somewhere along the way, I picked up a book of local recipes containing instructions on how to bake a foie gras cake and how to plant nuggets of foie gras in the creamy depths of crème brûlée. I kept encountering shops selling foie gras and nothing else. So frequently did I encounter foie gras on restaurant menus — sometimes four or five permutations in a single place — that I began to view it as a staple, like rice in Thailand or tortillas in Mexico. In one town, I saw a poster that appeared, from a distance, to be a map of local hiking trails — a welcome reprieve, because my body was by then begging for a strenuous perambulation. But when I looked closely, I saw that it was actually a guide to the famous truffle fields of the Périgord, this fertile pocket of the northern Dordogne: an epicurean treasure map. People in the Dordogne do like to eat. If there is a single thread connecting the cave painters of prehistory to the wine-cellar connoisseurs of today, it is the persistence of a hearty appetite. In fact, Henry Miller, the American writer and professional scamp who made appetite a central theme of his work, mused in his book The Colossus of Maroussi that the Dordogne felt like a place where living well appeared to have been the default mode for millennia. 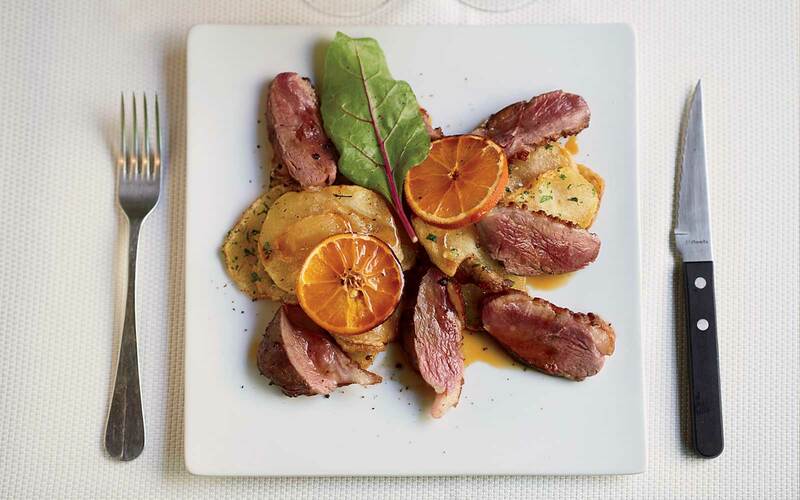 Roast duck with potatoes and orange at Au Bon Accueil, in the village of Limeuil. "Actually it must have been a paradise for many thousands of years," wrote Miller, who spent a month ensconced in the luxe serenity of Le Vieux Logis, an ivy-cloaked inn in a former Carthusian monastery in Trémolat, just before the start of World War II. "I believe it must have been so for the Cro-Magnon man, despite the fossilized evidences of the great caves which point to a condition of life rather bewildering and terrifying. I believe that the Cro-Magnon man settled here because he was extremely intelligent and had a highly developed sense of beauty." What had brought me to the Dordogne, even more than the cuisine, was the same thing that has lured visitors for decades: the paintings of the Cro-Magnon era. This year saw the opening of Lascaux IV, a state-of-the-art museum devoted to prehistoric cave art. It is located on the outskirts of the village of Montignac, a short stroll from the original hole in the ground where some French boys and their dog discovered the Lascaux paintings in 1940 — not long after Henry Miller passed through the area. 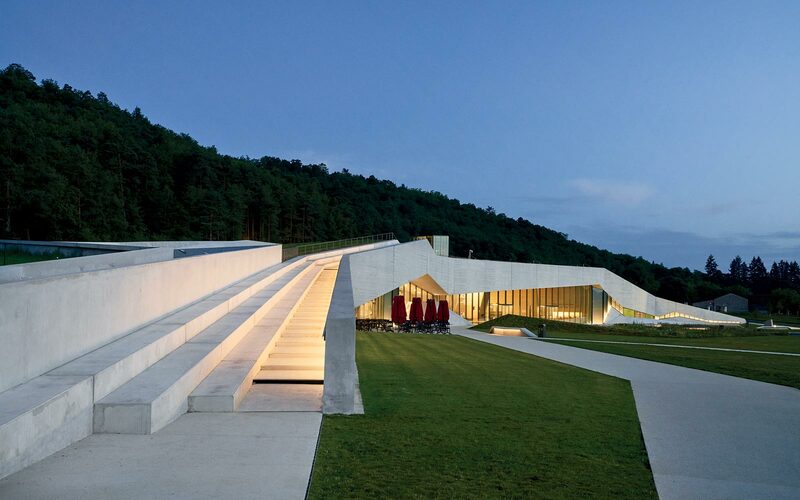 Designed by Snøhetta, the Norwegian architecture firm, Lascaux IV looks from a distance like a sleek, pale sliver sliced into the land to help you gain entrance to its depths. In spite of its contemporary glass-and-concrete façade, the building provides an astonishing portal to the history of the site, which the French government closed to the public in 1963 to preserve the artwork within. Lascaux IV offers a meticulous simulation of the caves, far surpassing in precision and thoroughness the replica held in Lascaux II, an older museum nearby. Designers have re-created the subterranean art galleries of these Flintstones–era muralists down to every nub and curve. The air inside is cool. Your nostrils pick up an earthy musk. You hear drips and pings. You feel as though you're in a real cave, but you don't have to worry about banging your head. Lascaux IV, the newly opened cave-art museum in the village of Montignac. Whether you are beholding actual cave paintings or their captivating facsimiles, you will probably find it impossible to refrain from developing your own hypothesis for why they were made. Were the swirling black-and-ocher tableaux of horses and bison meant to serve as a kind of tribal signature? A backdrop for stories passed down through generations? Instructions for a hunt? Religiously significant décor for a shaman's magic show? Plenty of books (including The Cave Painters) have gone spelunking in this territory, but the truth — as my Lascaux IV tour guide, Camille, kept reminding me — is that nobody really knows why they were made, and nobody ever will. It is immediately and inescapably apparent, however, that the paintings qualify as extraordinary works of art. What leapt to my mind when I visited Lascaux IV, as well as several actual caves in the Dordogne, was how much the beautiful images of animals tumbling across those rock walls belong to a continuum that links ancient Sumer and Egypt, Greece and Rome, leading eventually to Picasso and Miró, Haring and Basquiat. (At Lascaux IV, there is an interactive room devoted to drawing connections between the cave paintings and famous artworks of the 20th and 21st centuries.) I thought in particular of the relationship of Basquiat and Haring with graffiti, because the cave paintings and carvings of the Dordogne come across as a prehistoric version of tagging. They broadcast the most elemental of messages: "I was here." Once you've been initiated into the cave-art cult, it's hard to break free. The images haunt you. Two days after visiting Lascaux IV, I drove over to the Grotte de Rouffignac, where a little train carries you through the darkness into depths that get cooler by the minute. During the ride, a guide points out smooth, woklike pockets of rock in which cave bears used to curl up and hibernate. Eventually you descend toward numerous carvings of mammoths — Rouffignac is sometimes known as the cave of a hundred mammoths. Many of my fellow passengers were French children who became tremendously excited when the guide, using a flashlight, pointed out the faint outlines of tusks and woolly torsos. This was only natural. Despite being created with just a few spare strokes, the engraved creatures are instantly, charmingly recognizable — even kind of cute, with their shaggy snouts and alert eyes. Château Lalinde, on the Dordogne River. I felt the jones again the next day. I still had time in my schedule for one more cave, so I steered the rental car through the busy market in the town of Le Bugue, over some train tracks, and up a hill until I got to the Grotte du Sorcier, or Cave of the Sorcerer. Woodsmoke was chugging out of the chimney of a squat stone hut nestled against a cliff. Moss coated the rock shingles on top of the dwelling; ferns and flowers sprouted from the slope of the roof. It looked like a scene out of The Hobbit. Inside, I found Lola Jeannel, who leads tours and oversees the little Cave of the Sorcerer shop. She asked me to wait in an adjacent building, where I surveyed a cabinet des curiosités naturelles — a display case containing hyena teeth, the terrifyingly massive jaw of a prehistoric wolf, the tibia of a rhinoceros. Eventually Jeannel came to tell me that since I was the only visitor, she would give me a private tour. "If you think about it, prehistory is very new — brand-new," she said. New to us, she meant: many of the prehistoric engravings and drawings in France have been discovered only during the past 100 years or so. In the early 1950s, a farmer used to store his wine in this cave, unaware of or indifferent to the animals carved into the rock. You can't really blame him. It's not an especially dramatic cave. If you don't look closely, the engravings are nearly invisible. Once someone like Jeannel points them out, however, they come to life — in part because the Cro-Magnon artisans who made them often used the contours of the stone to give the images a sense of motion and three-dimensionality. Jeannel and I proceeded a few steps deeper to get a glimpse of the "sorcerer," a figure that is just vague enough to allow everyone to interpret it differently. What I saw was the outline of a large baby. And why not? The engravings, she said, "are like clouds. You can see many things in them." The same could be said of the Dordogne itself. The fact that it is not one of the most popular tourist destinations in France — not Provence or Paris, not the gastronomic magnet of Lyon or the chic beaches of the Riviera — makes it easier for a visitor to come without a trunk full of preconceptions. There is Michelin-starred, Relais & Châteaux luxury, to be sure, but time and time again I found that it was presented with a warm, effortless modesty. You travel to the Dordogne to see artwork created before the dawn of civilization, but you end up feeling like you've touched down in the most civilized place on earth. Le Vieux Logis, the refuge in Trémolat that captivated Henry Miller, seems to operate on the forgotten principle that you might want to unwind and linger, staying put instead of scurrying around. One evening I got dinner in the hotel's main restaurant, where the cooking of chef Vincent Arnould succeeds at a perennial French sleight of hand: it sounds heavy on the menu, but feels light on the fork. The service is ceremonial but warm. After I showed up for my reservation, I wasn't led to my table right away. A hostess encouraged me, instead, to linger in the outdoor courtyard with a chilled glass of vin de pêche, an aperitif made with peach leaves. From left: The dining room at Le Vieux Logis, in Trémolat; prehistoric artifacts at the Cave of the Sorcerer, in St.-Cirq-du-Bugue. I sipped the drink. I studied the breeze. I nibbled on one amuse-bouche after another. There was no pressure — the table inside was mine whenever I wanted it. In a place like this, it is pointless to watch the clock. After eating an appetizer of white asparagus stacked next to dainty curls of — yes — foie gras and an entrée of tender pink spring lamb, and then going a little overboard with the restaurant's bountiful cheese cart, I went for a walk along the country lanes that thread through Trémolat like silk. I did the same thing again the next night. "Eat cheese and go for a walk" strikes me as a sensible approach to life. Everywhere I went in the Dordogne, I encountered the same spirit I'd gleaned from the cave paintings. Call it an accidental elegance. I found it in that hilltop garden in Limeuil. I found it when I dropped by the charmingly unkempt headquarters of Château Lestignac, near the hamlet of Sigoulès, where Camille and Mathias Marquet make organic wines that American sommeliers have been going crazy over lately. I found it when I ambled into a beer bar called Plus que Parfait in the city of Bergerac and met Xavier Coudin, a bearded DJ who was spinning old, obscure American soul records while a crowd danced like extras in a Quentin Tarantino film. The songs seemed to float through the room like dust mites from some time out of mind. I wasn't sure what decade I had landed in, and I didn't care. The most striking example of the local style may have been my dinner at La Table du Marché Couvert, a diminutive restaurant next to a food market in Bergerac. In spite of its association with Cyrano, the romantic gent known for his proboscis and his poetic way with words, Bergerac doesn't spring to mind when you think of must-see metropolises in France. I didn't know what to expect when I wandered into La Table, where the cave-bearish chef Stéphane Cuzin was working in a kitchen the size of a canoe. But Cuzin wound up delivering one of my favorite meals in recent memory — as vibrant and colorful as a field full of wildflowers. It began with a parade of amuse-bouches. The one that left me gently reeling looked like a toy salad piled in a bowl by a precocious child after a hike: tiny beige mushrooms, bright-green fava beans, divots of olive. Together, these elements fused into a tiny still life, a bonsai manifestation of the French landscape. Cuzin's signature appetizer? You guessed it — foie gras. But this was foie gras reinvented through the alchemy of a chef's touch. Cuzin had paired the cool, cylindrical torchon with spring peas and raspberries, and it came to my table with the customary accompaniment of toasted brioche. 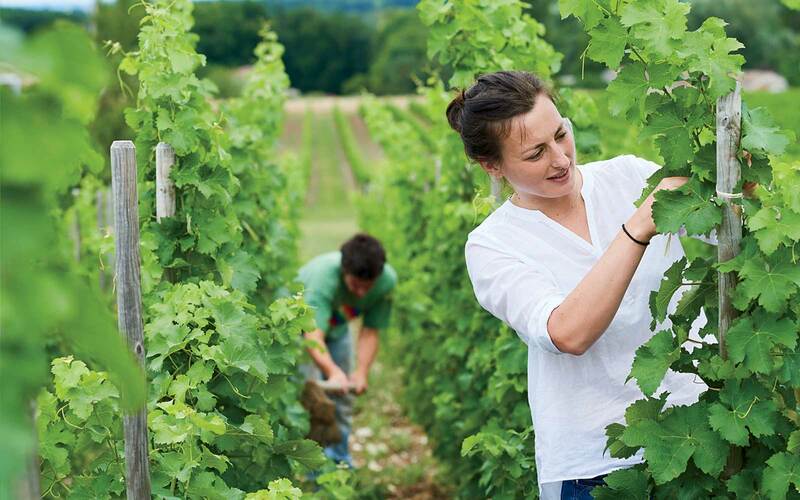 Camille and Mathias Marquet tend to their vines at Château Lestignac. I could feel it happening again, and deepening: the slowing of time, the marrow-savoring of the moment. We are wired to want this. A pattern had developed here in the Dordogne. I knew I had to follow up dinner with another walk. As I wandered through Bergerac, I noticed small, quick clouds whisking back and forth above my head. They were flocks of swallows, rising and falling in unison, landing in the branches of trees and then, in a mutually agreed-upon instant, launching back into the sky. The only reasonable thing to do was to stop and watch them. Jeff Gordinier is the food and drinks editor for Esquire. He is working on a book about the chef René Redzepi. 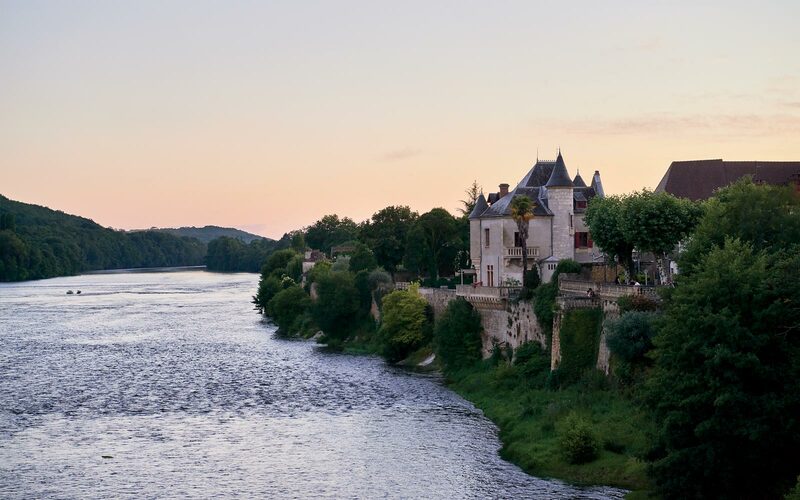 The Dordogne is a 90-minute drive east of Bordeaux, which is reachable via a connecting flight or two-hour ride from Paris on the recently launched bullet train. Rental cars are available at both the airport and train station. Le Vieux Logis: Henry Miller's early novels are pretty gritty, but his well-documented stay at this gem in Trémolat suggests that he also appreciated a bit of charm and elegance. Each of the property's 25 rooms is filled with period furniture and overlooks the village or the peaceful garden. doubles from $190. Au Bon Accueil: Way up the hill (yes, you'll have to walk) in Limeuil is some of the most honest and satisfying grub in the Dordogne — think rabbit casserole and creamy mussel soup. entrées $13–$27. La Table du Marché Couvert: Chef Stéphane Cuzin looks too big for his compact kitchen, but he’s got a delicate touch with both foie gras and vegetables. Bergerac; prix fixe menus from $43. Plus que Parfait: Bergerac's bohemians gather here at night to listen to funky grooves and sip even funkier beers and ciders. 12 Rue des Fontaines; 33-5-53-61-95-11. Grotte de Rouffignac: The tour of this cave is in French only, but English-speaking kids will enjoy the electric-train ride, regardless. Rouffignac-St.-Cernin-de-Reilhac. Grotte du Sorcier: Worth a visit to witness prehistoric art, fossils, and engravings. St.-Cirq-du-Bugue. Lascaux IV: Go to this museum to experience reproductions of each of the drawings found at the Lascaux caves. Stop on the roof for panoramic views of the Vézère Valley. Montignac.